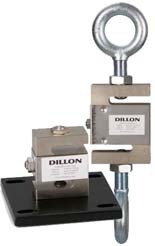 Dillon Load Cells are the heart of the force measurement systems we produce. We offer three types of load cells that will fit almost any force measurement system application. Model SGMT load cells are fitted for tension measurement. Model SGMC load cells are fitted for compression measurement. Our lighter capacity Model Z cells can be fitted for either tension or compression. 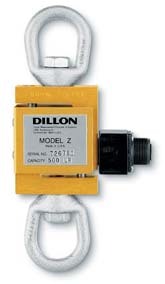 Dillon Strain Gauge load cells are simple to apply. Dillon offers the right mounting hardware for every application. For tension measurement you can select optional pull plugs, yokes, swivel hooks, eye nuts, or shackles. Compression load cells include compression fittings with base plates. The SGMT (tension) load cells come in six pound capacities from 2,000 to 100,000 pounds and in ten kg capacities from 1,000 to 40,000 kg. They have up to 300% overload capacity without zero shift at 2 millivolts per volt full scale sensitivity. The SGMC (compression) load cells come in six pound capacities from 2,000 to 100,000 pounds and in ten kg capacities from 1,000 to 40,000 kg. They have up to 300% overload capacity without zero shift at 2 millivolts per volt full scale sensitivity. 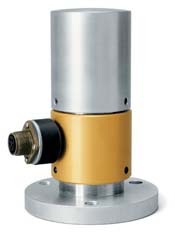 Lighter capacity Z-cells can be fitted for either tension or compression measurement. They have capacities from 25 pounds to 1,000 pounds with kg equivalents. They include an Ampnenol 14-S side mount connector for easy installation.